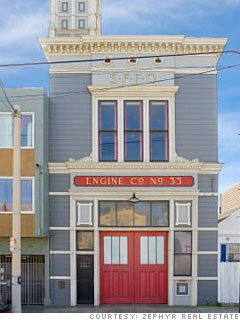 Description: This San Francisco house is perfect for the kid who wanted to be a fire fighter but became an accountant (or attorney or teacher) instead. For one thing, there's the striking Victorian design, complete with an elaborate cornice and a tall roof tower. The high windows were used to hang out the old canvas fire hoses so they could quickly dry and not mildew, according to the real estate agent Luba Muzichenko. There are lots of great details left over from its former life, including, of course, the fire pole and the old redwood wardrobe lockers where firemen kept their civvies. Other interior features include high ceilings, a fenced backyard, a hay loft, full basement and enough garage space for many cars. It's on the southern edge of the city, close to the ocean shore and the Golden Gate National Recreation Area. In just minutes, residents can motor out of the city and head down the sublime California coast or out into the Sierras. The current owners are also selling their city-tour business, which is housed in the ground floor garage. That would include a 1955 vintage Mack Truck fire engine used for squiring visitors around town. Muzichenko said owners were prepared to cut a very sharp deal for potential buyers with "the right vibe."